HypnoCoffee's own Angela has been rubbing elbows with philistines other than the HypnoStaff. 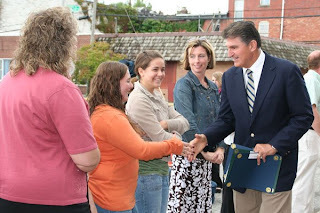 As you may already know, Angela recently procured her first car, however that isn't a picture of her and the car salesman; no that's her shaking hands with the Governor of West Virginia after a brief discussion about how much cooler HypnoCoffee is than all the coffee shops in Charleston combined. Our sources say the Gov' was hanging with Angela doing the typical glad-handing politicians are known for, when she mentioned the name "Hypno" sending the Governor into a tirade about subversive political discussions, "shady" patrons, an overabundance of foul language, unsafe work habits, and a blog that is written in "poor taste". We couldn't be happier with the Gubernatorial summation; thanks to Angela for eliciting such venom, you really are a snake charmer. A patron from Morgantown paid a visit to the HypnoVessel today and was intrigued by our menu offering of "I Will Yell At You". She pressed me for an explanation, and I of course, offered the straight answer, that I would scream in her face for the annotated fee. She was very impressed that such a service was offered and surprised that our prices are so reasonable (a similar service in Morgantown would cost upwards of $10.00). Stating that a good yelling was just what she needed to end her week, vowed to return Sunday morning and prior to returning home would be purchasing the yell to get her in the proper mindset for the week ahead. If not too busy, maybe she can bring the Gov' with her? How much would you charge to yell at the Governor? I would probably pay $12.95 (twelve dollars and ninty-five cents) for politicians but would want ten or fifteen minutes worth.